TRENTON, N.J. -- Outgoing Gov. Chris Christie said Tuesday that New Jersey needed "tough and plain-spoken leadership" when he took office eight years ago and he delivered it, pulling the state from "the brink of financial ruin" by confronting problems leaders of both parties had ignored for decades. "I ran to be different. I ran to talk bluntly. I ran to shine lights on all of New Jersey's real problems," the Republican governor said in his last state of the state address to the Legislature. Christie hands over state government to Democrat Phil Murphy in a week. Christie, who undertook a failed bid for the GOP nomination for president while governor, used his speech to cite a lengthy list of accomplishments during his two terms and to issue a warning that some could come undone. He touted the halving of the unemployment rate - to about 5 percent - and a sharp drop-off of increases in state property taxes, the nation's highest. But he warned they could soar again if the Democratic-controlled Legislature and governor don't extend a cap on salary awards to police and firefighters when contract disputes go to arbitration. The governor said he was the first governor in America to try to tackle the huge and escalating burden of state pension costs, saying previous governors from both parties and Legislatures "virtually ignored the growing menace of increased costs and no real contributions." Among the steps taken during his administration was dedicating lottery proceeds to the pension system for the next 30 years. When he took office, Christie said, New Jersey was "on the brink of financial ruin as a state." "We needed tough and plain-spoken leadership to deal with these problems," he said. He said he vetoed more than $7 billion in spending, helped cut the state workforce, pushed through a cap on property tax increases and, at the same time, made sure the state invested heavily to help protect the New Jersey Shore from the kind of devastation it suffered during Superstorm Sandy in 2012. The prepared text of his remarks didn't show him invoking the name of his friend, President Donald Trump. But he called it an "honor" to chair the White House's opioid commission. 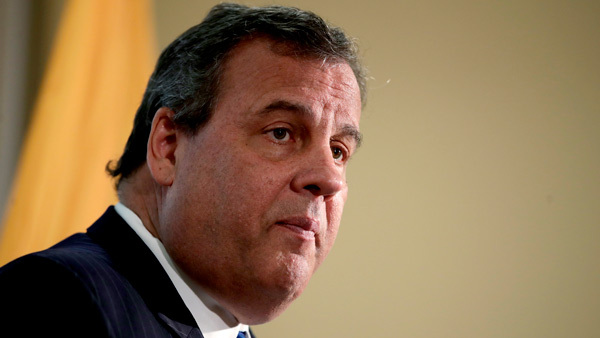 Christie's speech caps his stint as one of America's best-known governors. He was on the cover of Time magazine under the headline "The Boss" and a periodic guest on late-night television, where he memorably appeared in a skit about "dad dancing" with Jimmy Fallon and poked fun at his weight by eating a doughnut on David Letterman's show. At least in the beginning, he won acclaim for his forthrightness, like when he told beachcombers to "get the hell off the beach" in 2011 during Hurricane Irene. He told it like it was before Trump brought the practice to the White House. He also was exceedingly popular and widely praised for guiding the state in its recovery from Superstorm Sandy, which ravaged the coastline. He was briefly seen as a top GOP contender for president. But he was also criticized for testy exchanges with the public during town hall meetings and other encounters. His popularity and job approval felll sharply, particularly after the George Washington Bridge lane closure scandal in which three of his allies were convicted in a political retribution scheme. He also lost the home crowd after spending much of 2015 and early 2016 campaigning for president out of state, a contest he dropped out of after failing to emerge from the back of the pack. He returned to New Jersey and focused on the state's - and country's - opioid addiction crisis after failing to get a top job in the Trump administration. A regular theme in his remarks around the state included "second chances," and the idea that people can make a comeback.